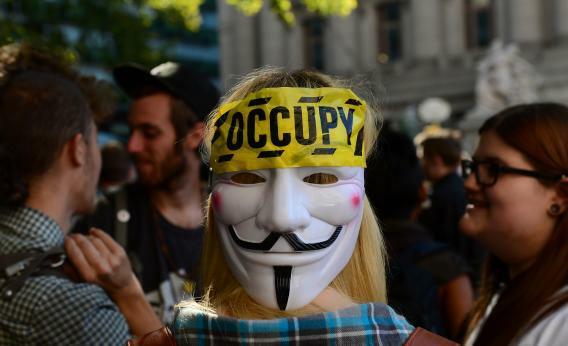 Occupy movement’s first anniversary: What should the 99 percent do next? Occupy Wall Street Is a Year Old. Time To Grow Up. Participants in the Occupy Wall Street protest take part in a rally to mark the one year anniversary of the movement in New York on Monday. Occupy Wall Street is only 1 year old, and yet its slogan—“We are the 99 percent”—has become ubiquitous. The movement has forced us to focus on issues of equity and fairness that had fallen off our political radar, even after the financial cataclysm of 2008. We are now scrutinizing tax policies that favor the wealthiest 1 percent, and we are finally asking harder questions about a financial sector that drove the economy into a ditch. For an essentially—and indeed intentionally—disorganized group of folks to have such an enormous impact is quite an accomplishment; they are redefining and rebalancing our political discourse. So to all those who are dissatisfied because the Occupy movement did not grow into the complete political theory or social agenda that some wished, I say: Give credit where credit is due. This is a great American success story. But we do have to ask, “Now what?” A few sporadic protests on an anniversary do not substitute for a more meaningful agenda. So, here are two proposals. First, a programmatic suggestion. Choose one important idea that is perhaps outside the confines of our ordinary political chatter, and place it on the agenda. My vote goes to Martin Wolf’s proposal of a wealth tax—a very low tax on wealth that can be used to pay for much-needed government programs, reduce inequality, and lower tax rates on those who are really struggling. 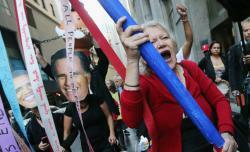 Protesters affiliated with Occupy Wall Street march in the Financial District on Monday in New York City. Second, a political suggestion. The Occupy movement needs an organizing principle, and—just as the Tea Party did—it needs some actual measures of success. Choose one candidate whose agenda is squarely within that of the movement and make his or her electoral success a focal point. This will give structure, a way to measure and demonstrate success, and a point of leverage over time, as successful candidates enter government and become more responsive to the movement. My first choice: Elizabeth Warren. Nobody out there better captures the ethos of what the moment is all about. But whoever and whatever cause they adopt, Occupy has to move on from last year’s protests. A year is an eternity in politics—though less than a moment in history. But you can’t survive long as a movement unless you push affirmative ideas, and start backing real candidates.